^ Tucker, Ken. The 5 Worst. EW.com (Entertainment Weekly and Time Inc.). 2005 [2006-07-14]. 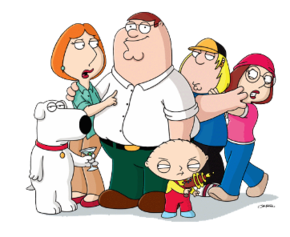 ^ Family Guy's Stewie Has an Untold Story. TV Guide. （cc-A51B-308EB2529BBA%7D&cmsSrch 原始内容 请检查|url=值 (帮助)存档于2006-10-25）. You know, it's funny. Matt Groening and I actually have a great relationship. We've talked several times in the past few weeks and joked about this. One day out of nowhere this rumor pops up in papers and magazines. Actually, it was probably one comment that was taken out of context in Blender. Matt's just a cool guy, and fortunately neither of us was ruffled by any of that stuff. We just laughed it off. ^ Treehouse of Horror XIII. The Simpsons. 第14季. 第292集. 2002-11-03. Fox. Story: "Send in the Clones"
^ Adams, Bob. "Family Guy" has fun with AIDS. Advocate.com. PlanetOut Inc. 2005-08-22 [2006-12-12]. ... showcases a comic musical number called “You Have AIDS.” Overburdened AIDS service organizations are not amused. ^ The Hollywood Reporter. hollywoodreporter.com. [2008-02-29]. （原始内容存档于2008-05-30）.